The suspects: Balogun Olumide Ojo and Augustine Opaso were arrested in Port Harcourt, Rivers State. 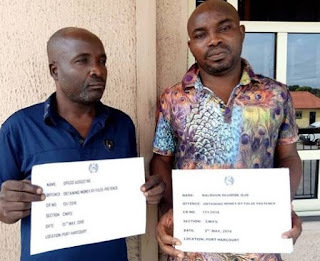 They were arrested based on a petition by their victim, who alleged that the suspects deceived him into believing that he could access his family wealth through some "special prayers" that would offer him "money medicine". One of the suspects, Ojo was arrested at the Reception hall of Presidential Hotel, Port Harcourt where he was waiting to collect more money from the victim. Investigation by the EFCC showed that the suspects were operating in Port Harcourt and Akungba, Ondo State. Ojo confessed that they were operating a shrine in Akungba where " special money-making prayers" were being offered.